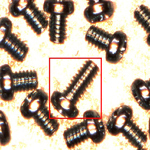 Suitable for Screw, Washer, Housing, Gear etc. With the continuous increasing demand on quality improvement for parts, Don’t you think the overload of your visual inspectors is too much? This system meets all your needs in automation/stabilization of parts inspection process. Automatic detection of irregular parts based on color, shape, size, length etc. 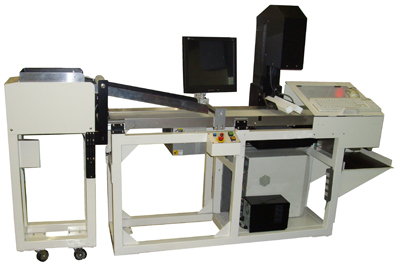 IM-1000 is compact off-line type inspection system. However it is also possible to build the scanner unit into any production line. If customers want to change to automatic on-line inspection system we will be happy to respond. When using the IM-1000 system the operator removes the overlapped parts from the top of each other. 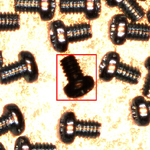 In our experiment results, inspection speed is around 1,000 pieces/min for M4 screws. On the other hand, if there is no overlapping parts inspection around 30,000 pieces/min for M4 screws would be possible. This amazing speed is simply due to KGK image processing algorithms eliminating the need to one-by-one inspection. There is no need to usual hard parameter setting of inspection system. The KGK “teaching-less system” can “learn” the necessary specifications of parts just from the samples and enables you to start using machine easily from the first day and for new products. 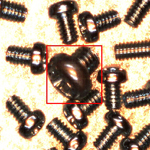 (*) Number of pieces to be inspected in one minute depends on the part size.